Each of these sections focuses on a wide array of review material using a variety of different question types that are specific to the GED test, including multiple-choice, fill-in-the-blank, short answer, drop down, drag and drop, hot spot, and extended response questions. 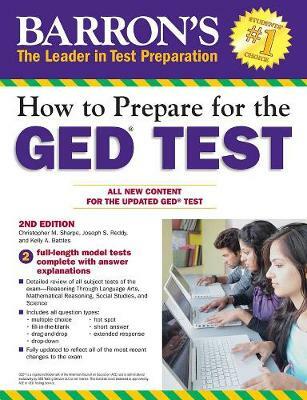 The Barron's How to Prepare for the GEDA ® Test book outlines the GED test in detail, describes strategies for success on test day, and provides extensive review coverage of all of these major content areas in a logical progression that allows readers to build on their skills as they go along. Each of the four major review sections provides a pretest that allows readers to assess their strengths and weaknesses followed by detailed lessons of every topic they need to know for that section. The review sections also include lists of essential vocabulary terms and formulas pages, where appropriate. All of the major subject reviews close with a review test for added practice. The book concludes with two full-length practice exams that feature the different GED question types and include answer explanations for every question. This book can be purchased alone or with a CD-ROM that contains two additional, full-length practice tests that readers can use to simulate actual testing conditions for the computerized test.